1. Lonely Planet – probably the most popular guide book on this list, Lonely Planet provide a massive amount of information, put together clearly and concisely by people who have really travelled and know their stuff. 2. Time Out City Guides – full of illustrations, photos, maps and colour, these vibrant guides really jump off the page, making them an interesting and exciting read as you find out all about the city you are visiting. 3. 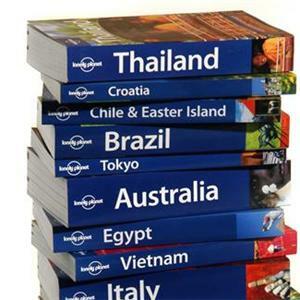 Rough Guides – again, a very popular brand, these guide books contain, much like the Lonely Planet books, a huge wealth of detail and facts about cities and countries, giving you, the traveller, a head-start in knowing where to go and what to see. 4. Let’s Go – aimed specifically at students, these budget travel guides are a must have for any traveller looking for some great deals, and some great information too. 5. DK Eyewitness Travel – these little books are some of the best city guides out there, especially their compact Top 10 city guides, which list the top 10 things to do or see in different categories in each city. *Please note: whilst I do think that using travel guides to get you started is great, some of the best travel experiences I’ve had have been when I’ve left the guide behind and gone purely on the recommendations from people I’ve met on the road.